The Offshore Patrol Frigate THETIS arrives Copenhagen in August 2007. 3 ea MAN-B&W Diesel Engines, 13,000 Hp. 1 ea Bowthruster 884 Hp. 1 ea Azimuth Thruster 1,088 Hp. Modified at Århus Flydedok ("Dockyard"). The stern was flattened for the mounting of a cable port in the stern. 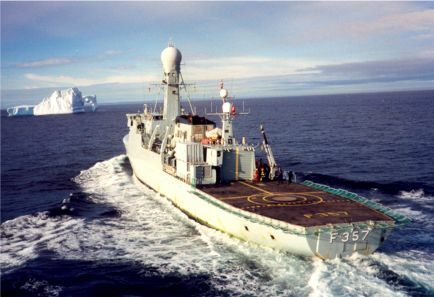 Reached a position 79o 29,4' N off the east coast of Greenland, the far north any Danish navy vessel had ever been. The Royal Danish Navy signed a 5 years contract with Nunaoil A/S in the spring of 1991. 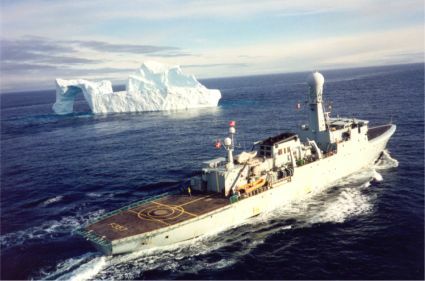 The THETIS was to be used for seismological surveys off the coast of Greenland (Project KANUMAS). THETIS is the only one of the class that has a flattened stern. 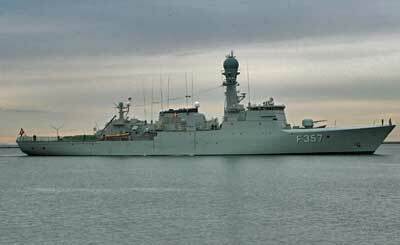 The Offshore Patrol Frigate THETIS.